WHO: Albert Maysles, David Maysles and Ellen Giffard co-directed this. The film places great importance on the two remaining hours the workers have in which to get the curtain up before the winds change direction, thereby threatening not only the completion of the curtain but the lives of the workers. But time here is simply a question of deadlines to be faced -- a classical overcoming of obstacles, successfully achieved in all of these Christo and Jeanne-Claude films, which, with one exception, end on a note of triumph. These films return to a variation on the crisis structure of the Robert Drew films from which David and Albert Maysles had originally wanted to break away. WHERE/WHEN: Screens tonight as part of Oddball Films's 8PM Monumental Artscapes program, and will also screen during the week of May 8-14 (precise time/day to be announced) at the Vogue. Tonight's Oddball Films show juxtaposes Christo's Valley Curtain with Robert Smithson's 1970 film of his own Spiral Jetty in Utah's Great Salt Lake, as well as films and footage focusing on artists David Alfaro Siqueiros, Claes Oldenburg and G. Augustine Lynas, providing an opportunity to contrast the Maysles documentary approach against other filmmakers'. A more jarring juxtaposition may be achieved by the opening double-bill in the Castro Theatre's just-announced April calendar, which pairs the Maysles' (and Ellen Hovde's and Muffie Meyer's) Grey Gardens with a 35mm print of the notorious John Waters gross-out Pink Flamingos. No fooling! Further down on the horizon, details are just starting to come out about a week-long Maysles tribute at Frisco's forgotten single-screen cinema the Vogue, on May 8th-14th. Sixteen films co-directed by Albert Maysles will be collected together, presented by luminary special guests including (but perhaps not limited to) Jon Else, Joan Churchill, Stephen Lighthill, and (by Skype) D. A. Pennebaker and Susan Froemke. All of the aforementioned Maysles films will screen at least once during the festival, as well as Meet Marlon Brando on May 8th, Get Yer Ya-Yas Out! on May 9th & 14th, and more Christo/Jeanne-Claude films The Gates May 10th and both Islands and Umbrellas on May 12th. More information is forthcoming. The festival is the brainchild of Brisbane documentarian David L. Brown, who I suspect was involved in the film screening at this "Sneak Preview" tribute to another non-fiction legend, Les Blank at the Sebastapol Documentary Film Festival tomorrow night. 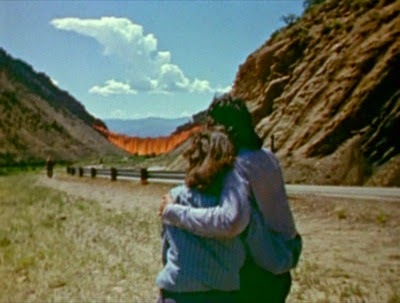 HOW: Tonight's Oddball screening will be all 16mm; I'm told Christo's Valley Curtain is a particularly lovely print. The May festival's formats are as yet unspecified, although I would bet on digital knowing how infrequently the Vogue has screened celluloid in the last couple of years.